Box measures 8" x 6 1/2 " x 3.5"
BB-8 will never let you down! Just take a look at his track record from both Star Wars: The Force Awakens and Star Wars: The Last Jedi! He can fix up your X-Wing in seconds. He can carry your secret map to find Luke Skywalker. He can even be your traveling buddy when you're trekking through the deserts of Jakku! There's just about nothing that the little Star Wars droid can't do. Why, he can even carry your lunch for you. This adorable Star Wars BB-8 tin tote is proof of that! 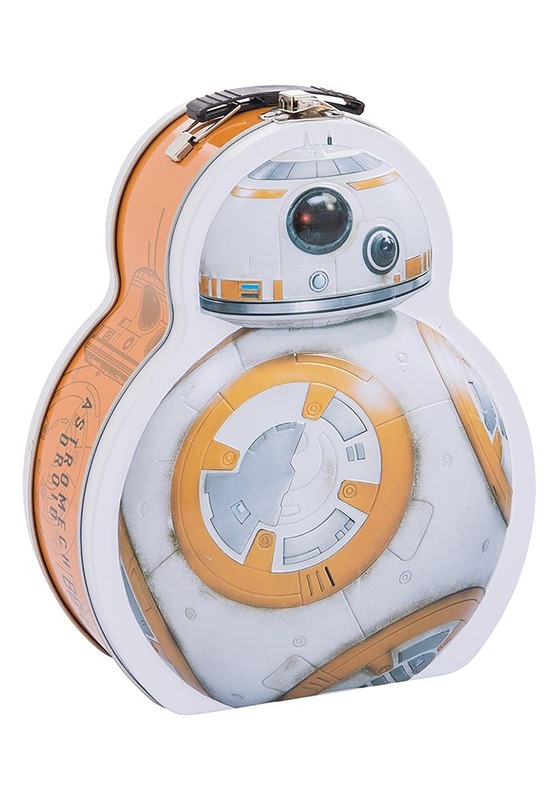 This Star Wars BB-8 lunch box is officially licensed and it's designed to look like the peppy little robot from Star Wars: The Last Jedi. It's made out of tin and has a plastic handle for carrying. It also comes with a metal clasp to help keep your lunch secured inside. The exterior has a brilliantly colored image of BB-8. Poe Dameron and Rey both know how useful it can be to have the little droid around, and now it's your turn to find out how helpful BB-8 can be! You'll always have your snacks at hand when you carry this Star Wars tin tote!